Under the watchful eye of heavy police presence, uMfolozi TVET College students burnt tree branches and other rubble in Richards Bay. 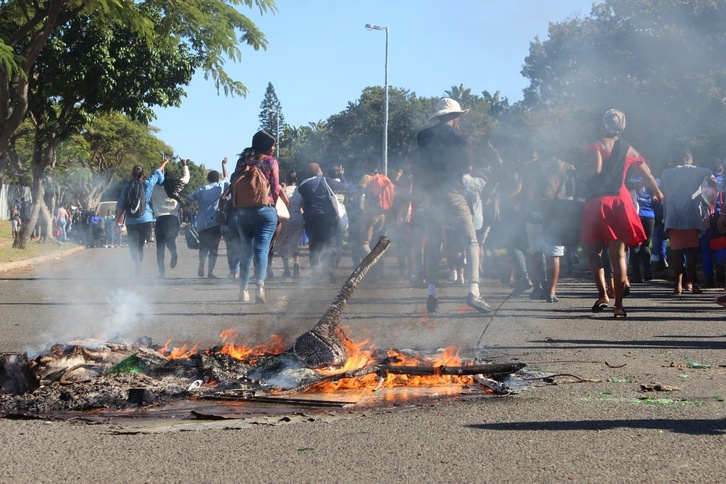 uMfolozi TVET College students protested outside the Richards Bay campus on Monday demanding payment of their National Student Financial Aid Scheme (NSFAS) allowances, reports Zululand Observer. Under the watchful eye of a heavy police presence, students burnt tree branches and other rubble on Via Richardia road in Arboretum demanding answers from the institution. “Last week Friday most of us received notifications that the R6 000, which is an allowance we receive from NSFAS, had been deposited. “However, when we went to withdraw it, some of us found that there was only R3 000, or for some there was no funds at all. “When we contacted NSFAS regarding this we were referred to the college. But the college refuses to give us clear answers, which is why we have decided to protest,” a student leader who did not want to be named said. Another student voiced her frustration regarding the college’s “failure to communicate with students”. “The money reflected last week but when I went to withdraw it, there was nothing and the college won’t speak to us. 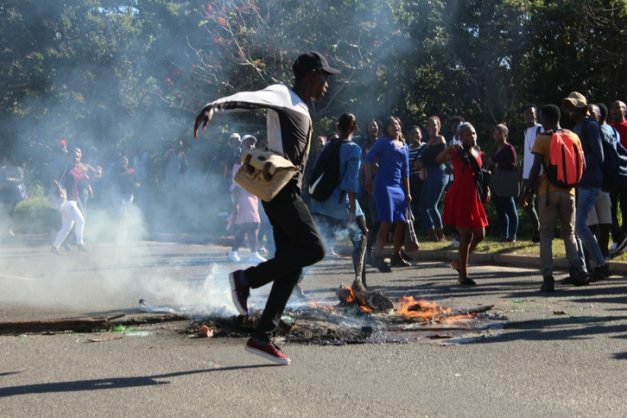 “The worst part is when we graduate and start working, NSFAS will want us to pay back the money, money we did not receive or use,” another student said. Clarifying the payment system for allowances, the college’s marketing and communications director, Bhekani Ndlovu, said “students who applied for travelling and meal allowances receive it through the NSFAS system known as sBux”. “The college has nothing to do with those allowances, students get it directly from NSFAS. The allowance for accommodation is transferred by the college for students who applied for it when they applied for NSFAS. That is where the misunderstanding and confusion lies. The allowances differ according to what the student applied for,” Ndlovu said. Ndlovu added that once management had received a memorandum, they would be able to address the students’ grievances.